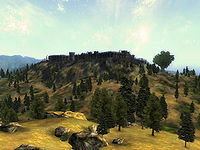 Kvatch is a city in the hinterland of the Gold Coast of Cyrodiil, located between Anvil and Skingrad. It is built atop a large bluff, raising the city above the surrounding forests. 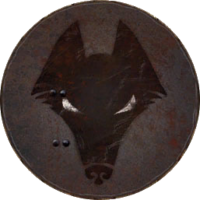 Its coat of arms is a black wolf on a grey background. The city is home to an arena, the imposing Kvatch Castle, and the Great Chapel of Akatosh. County Kvatch extends far to the northwest, up to the Brena River at the border of Hammerfell. During the fifth century of the First Era, the kingdoms of Kvatch and Skingrad were rivals. Their skirmishing ended in 1E 472, during which time Kvatch was under rule of King Justinius. The king's daughter Belene was wed to Prince Rislav Larich of Skingrad, presumably to make peace between the two kingdoms. Towards the end of the fifth century, the Kings of the Colovian West joined with Kvatch and Skingrad to resist the Alessian army and its Reform. This open rebellion helped prompt Clan Direnni's excursions into Cyrodiil and ultimately the collapse of the Alessian Empire. Kvatch was a major settlement when it was sacked by the Camoran Usurper in 3E 249. At the center of the city stood a statue of Antus Pinder, a hero who led the defense of the city against an unspecified superior force. Despite being defeated gravely, the statue was erected to remember his courage and spirit. By the late Third Era, the ruling family of Kvatch was the Goldwine lineage. A conflict over inheritance caused the death of both sons of Count Ormellius Goldwine in 3E 432, causing a short period of unrest in Kvatch. In 3E 433 the Dunmer saint, Jiub, moved to Kvatch to begin work on his autobiography. Not long after the assassination of Uriel Septim VII that same year, the city was razed to the ground by Daedra as the opening move of the Oblivion Crisis, leaving Kvatch with no count. Many of its citizens were also killed, and those who survived either fled into the countryside or congregated at a refugee camp at the foot of the bluff. Among the survivors was Martin Septim, who escaped the city after the Hero of Kvatch closed the last remaining gate to the Deadlands. With all the Oblivion Gates sealed, the Kvatch city guard were able to enter the ruins and retake Kvatch Castle with the aid of the Hero and the Imperial Legion. Kvatch provided what little men it could afford to aid in the defense of Bruma later that year. At the opening of the Fourth Era, following its liberation from the Daedra, the city was uninhabited and only the chapel and castle remained standing. The city had been rebuilt by the time the Great War broke out in 4E 171.